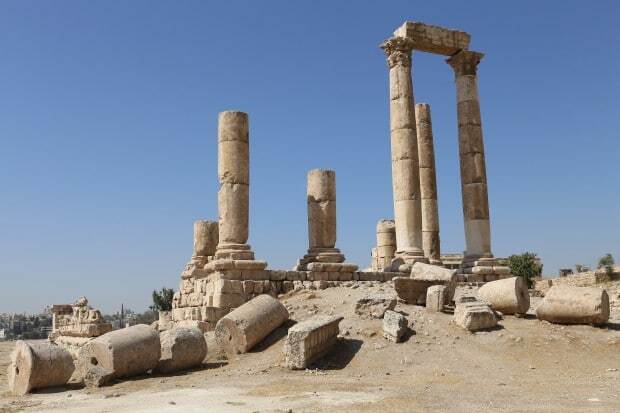 Amman is a thoroughly twentieth-century invention: it was little more than an unregarded, muddy farming village when Emir Abdullah chose it to be his new capital in 1921. The sense of Amman being a village-made-good is highlighted when you spend some time on the busy downtown streets. 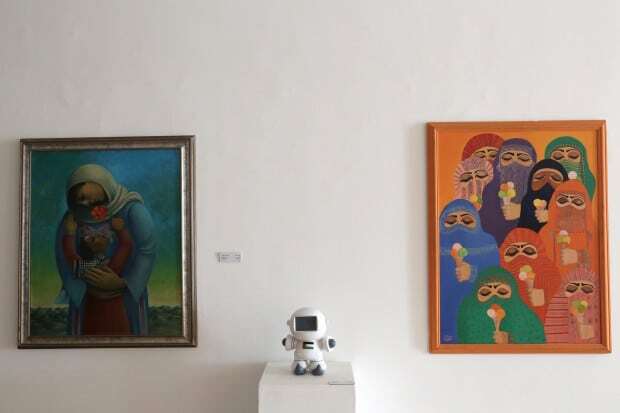 Here the weight of history that is a constant presence is the heart of many Middle Eastern cities is absent; Amman, instead, is distinguished by a quick-witted, self reliance. 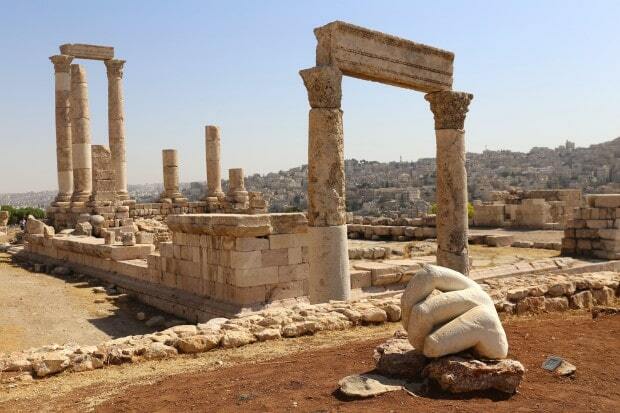 Most Jordanian travel itineraries make the error of overlooking Amman as nothing more than a means to get to the airport. I’d argue that you should dedicate three days to the capital, a perfect place to beat your jet lag, slowly swoon through local art galleries, sip up at bustling coffee shops and laze in the desert afternoon heat via luxurious hotel pool. 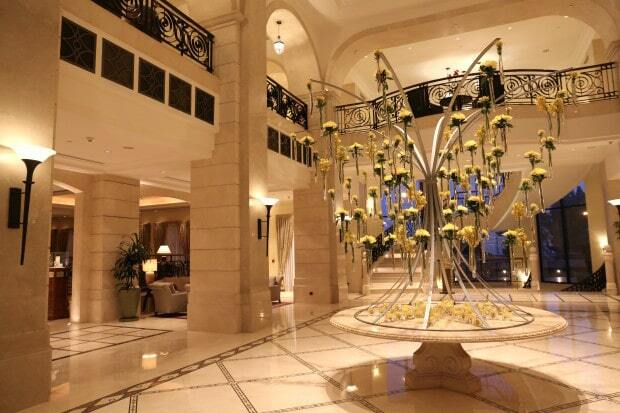 Set upon the highest of Amman’s seven hills, the city’s most luxurious hotel is the Four Seasons Hotel Amman, a 470,000 square foot fortress which offers its guests stunning panoramic views of the capital. The hotel’s double height entrance echoes grand monuments of Jordan’s ancient past, large pillars reflect the old Roman Empire and warmly coloured Jordanian stones accent marble and mosaic motifs. Guests are greeted by a breezy lobby prettied on the daily by an architectural tree outfitted with hundreds of sweet smelling posies. The hotel’s Five Grill & Lounge located on the ground level just off the lobby is a popular hangout for well heeled locals on weekends. 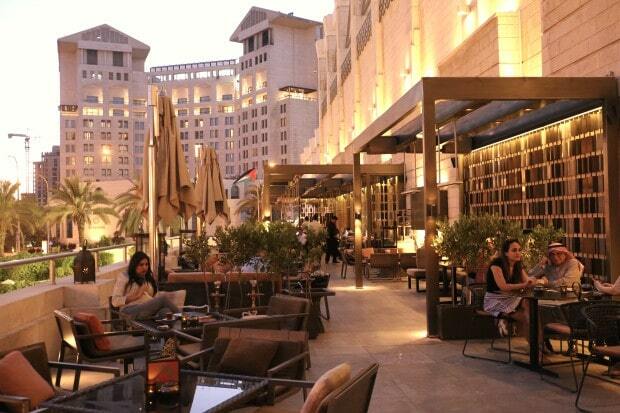 The al fresco dinning room splashes out on a spacious terrace offering a perfect perch for people watching while bubbling through aromatic shisha as resident DJ spins upbeat ballads late into the night. The 15-storey luxury hotel offers 192 of Amman’s largest hotel guest rooms and suites – each with a panoramic view of the city. 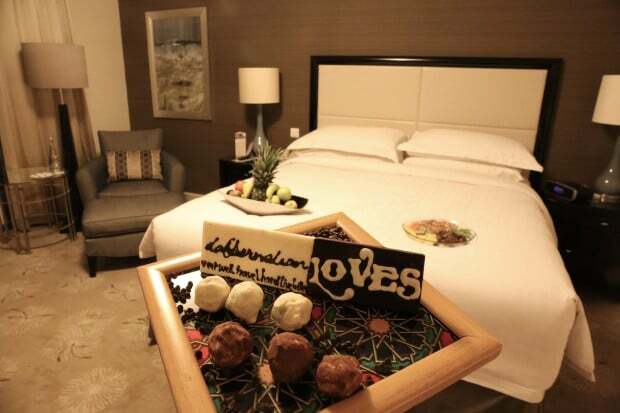 I was delighted to arrive to my room to discover a warm Jordanian welcome featuring fresh fruit bowl, plate of spiced nuts and dried fruit and a platter of chocolate truffles with a white and dark chocolate dobbernationLOVES logo crafted by the hotel’s pastry chef. Four Seasons always gets it right, with the little details. My room featured soft down duvet and pillows resting on comfy King, verbena scented L’Occitane bath amenities, thick terry bathrobe and marble lined bathroom. 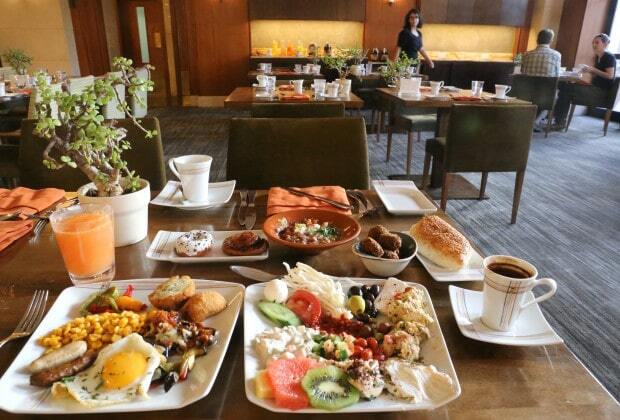 Four Seasons Hotel Amman is perhaps best known by locals for its jaw dropping brunch offering. The Levantine inspired buffet is served daily at Restaurant Olea. Hot Tip: wake up to the world on the restaurants intimate patio while the sun splashes across the city. Ask your server for freshly squeezed juice and either Turkish or Arabic coffee before hopping out of your seat and whisking your way through the buffet. You’ll find international classics (eggs, sausage, cereal, fresh fruit, pancakes, pastries) but the highlight of course is the local specialities on show, my favourites being crispy falafel, warm bowl of Foul, fresh olives, spoons full of yogurt and cheese, sesame flecked flatbread and crunchy croquettes. 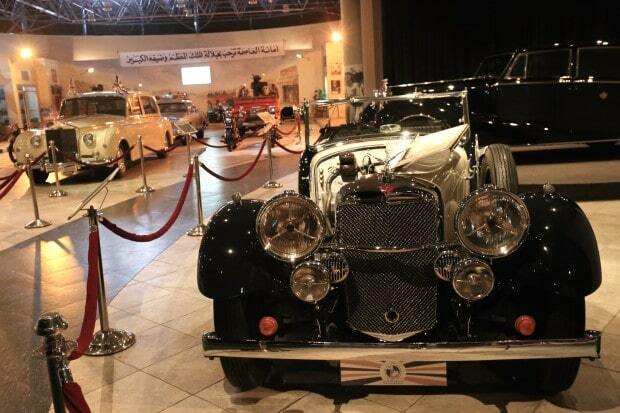 Inaugurated by H.M. King Abdullah II in 2003, the Royal Automobile Museum is the first public automotive museum in the Arab world. 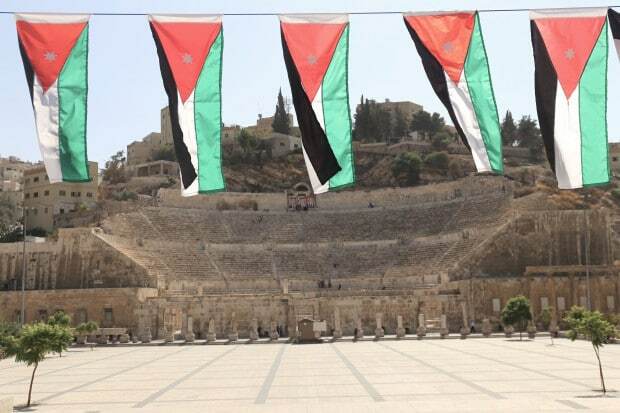 It serves as a tribute to the late King Hussein while showcasing part of Jordan’s history and journey. 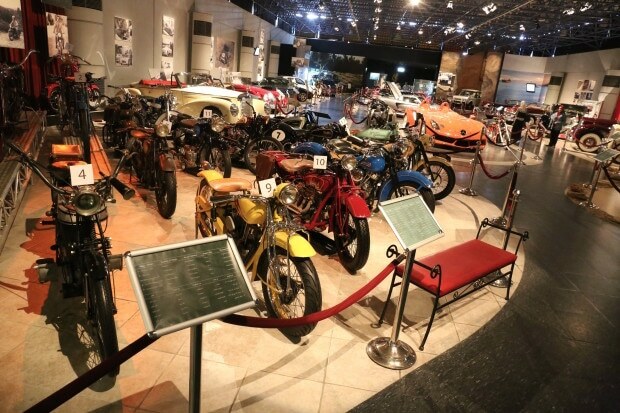 The museum displays over 100 royal cars and motorcycles, some dating as early as 1907. Standing in pristine condition, they highlight the 47-year reign of King Hussein as well as the history of the Hashemite Kingdom from the era of H.M. King Abudullah I in the early 1920s to modern day. The fine building, designed by star Jordanian architect Jafar Touqan, blends in with its natural surroundings by being partly sunk into the earth and clad in untreated stone. The airy, spacious exhibition areas are filled with vehicles with a royal connection, ranging from a 1916 Cadillac through some elegant Rolls-Royce (and even a 1952 Triumph Thunderbird motorbike) to a Porsche 911 turbo. Petrolheads will be enthralled. Perhaps Amman’s most famous thoroughfare, Rainbow Street has become known for two things: cafes and traffic. It has become one of the city’s prime spots for socializing. All tastes are catered for – there are traditional coffee houses, zingy contemporary espresso bars, cosy hideaways for organic tea-lovers and swanky DJ venues, alongside antique shops, craft studios and top quality restaurants. When it opened in 1997 this was Jordan’s first-ever internet cafe – combining a bookshop with a cafe-bar and the novelty of online access. The fact that, all these years later, it’s still at the cutting-edge of the city’s social scene is testament to how perfectly it hit the spot back then (and clung on tight). The decor is wild, flowery and ultra-retro, the ambiance always light and coffee top notch. I visited the patio on the weekend in the afternoon to find the place packed with locals enjoying massive plates of French Toast and poached eggs while sipping on wine and slowly exhaling sweet smelling shisha. I thirst quenched on a citrus-forward locally produced Blonde Ale produced by Carakale. Craft breweries in the Middle East? A delightful surprise! [email protected] is perhaps best known for being the only LGBT friendly venue in the city (if not all of Jordan). Best time to mix and mingle with local gays is on the dance floor in the wee hours of the night on weekends. 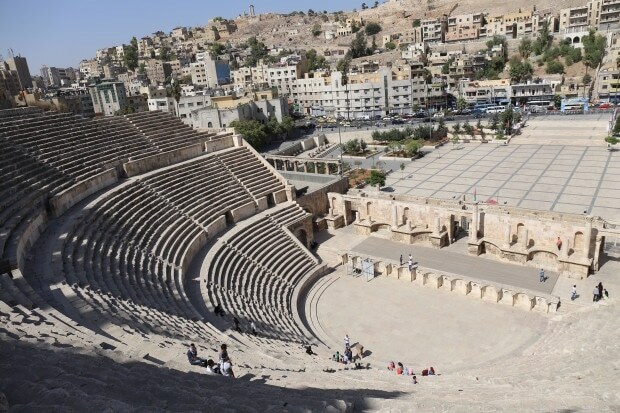 The Roman theatre, dominating the heart of downtown, was the centrepiece of Roman Philadelphia, and also the initial focus for Amman’s modern settlement late in the nineteenth century. As you approach from Hashmi Street, a long Corinthian colonnade and some original Roman paving are the only physical remains of Philadelphia’s forum, the marketplace which filled the gap between the theatre and the street. Cut into a depression in the hillside, the Roman theatre itself is impressively huge, and the view, as well as the ability to eavesdrop on conversations between ant-like people on stage below, definitely repays the steep climb to the top. The structure was built between 169 and 177 AD, during the reign of Emperor Marcus Aurelius, for an audience of almost six thousand, and is still occasionally filled today for concerts. Citadel Hill has been a focus for human settlement since the Paleolithic Age, more than 18,000 years ago. Unfortunately, when the Romans moved in to occupy the area, they cleared away whatever they found, including the remains of the Ammonite city of Rabbath Ammon, and chucked it over the side of the hill: Bronze Age, Iron Age and Hellenistic pottery shards have been found mixed up with Roman remains on the slopes below. Of the remains surviving today, the most impressive by far is a huge Umayyad palace complex on the upper terrace of the Citadel, dating from the first half of the eighth century. On the middle terrace below and to the south lies the Roman Temple of Hercules, its massive columns dramatically silhouetted against the sky. The Temple of Hercules, its towering columns visible from Downtown, was built in the same period as the Roman Theatre below. The Roman dedication to Hercules is not entirely certain but, given the quantity of coins bearing his likeness found in the city below, pretty likely. Look out for the giant marble hand displayed nearby, part of an immense statue also thought to be of Hercules. 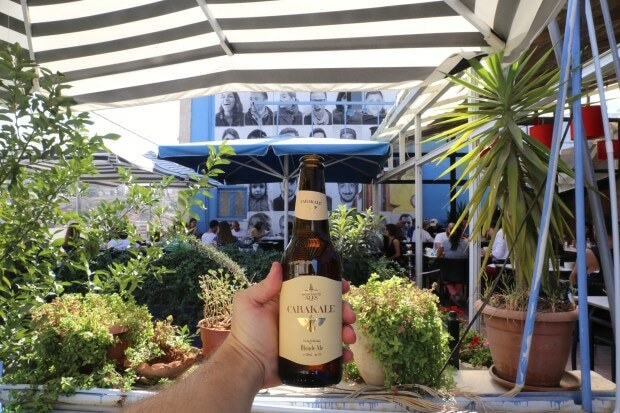 Jordan is full of sippable surprises, offering visitors a petite selection of craft beers and award winning wines. If you’re an oenophile keen to sample the nation’s best grapes in the glass pop by Zumot Fine Wines for a tasting of the countries internationally lauded Saint George series. 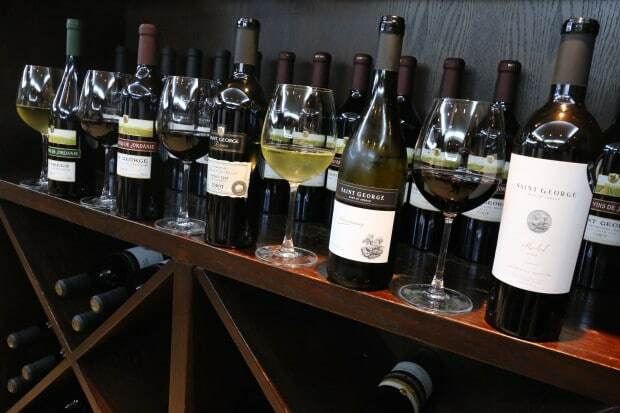 The family owned operation planted their first vines in 1994, selling their first bottles to local wine lovers in 1999. Since then they have won over twenty awards in international competition and are considered one of the Middle East’s finest wineries. Enjoy a tutored tasting in the winery’s showroom, located in the heart of Amman and you’ll quickly fall in love with sweet Shiraz Rose, buttery Chardonnay and bold Merlot. 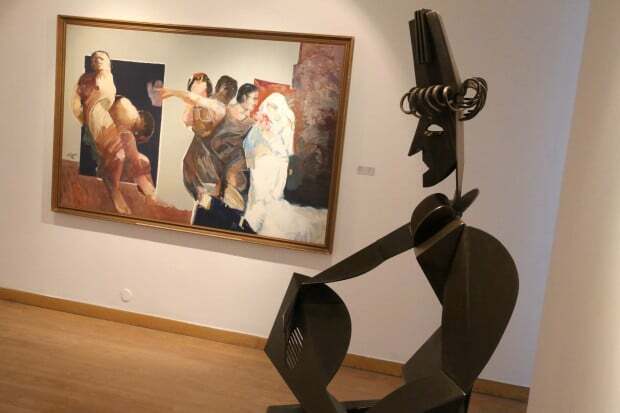 The Jordan National Gallery of Fine Arts is the country’s premier establishment showcase for contemporary art, with artists from Jordan, the Arab world and the wider Islamic community all represented in a changing programme of shows drawing on the 2000-work permanent collection. Exhibitions are split between the main building and an annexe in a town house opposite; take time to stroll in the pleasant garden between the two, which also houses the chic Canvas art lounge and cafe. Habibah is the best patisserie in the city, if not the country, piled high with every conceivable kind of sweetmeat, pastry and biscuit. There’s a cafe upstairs for eat-ins (a short stroll from the Roman theatre) so I suggest popping by hear for a break in the middle of the day to rest your feet. 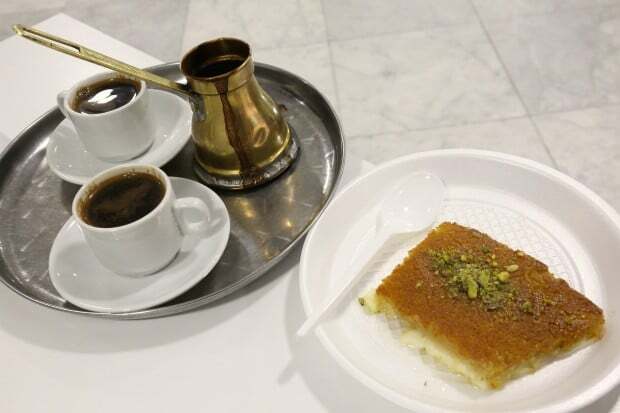 Sip on Turkish coffee and munch on a plate of kunafeh, a Palestinian dessert featuring fresh local cheese, crispy pastry doused in honey and crunchy pistachio. From the Roman Theatre, lively Hashmi Street storms west past shawarma stands, juice bars, patisseries and cafes towards the commercial hub of downtown and the focal, pink-and-white striped Grand Husseini Mosque. The city’s most colourful market Hesbah Souk, can be found just outside and features winding pedestrian paths where local farmers and merchants sell bags full of colourful spices, plump olives, dried fruit and nuts and towers of figs, oranges and pomegranates. One of the most innovative developments in Amman’s dinning scene in recent years is Beit Sitti, a project set up by Maria-Haddad and her sisters Dina and Tania in which visitors cook their own meal under supervision. In a spotless modern kitchen, installed in a charming historic town house, you get to spend a couple of hours handling ingredients, learning techniques and hearing stories of culinary endeavours from chefs – generally wives and mothers with a lifetime of cooking behind them – as you prepare a three-course Arabic meal. Then, of course, you scoff your handiwork together, on the shaded front terrace, with a gorgeous view over the Downtown rooftops. Thanks for the info! Excited for my trip to Amman! Loved that video of the cooking pass with the food passing by. hehe!